Background: Osteonecrosis of the femoral head (ONFH) results from an interruption of the blood supply to the femoral head or injury-caused death of chondrocytes and bone marrow components. Many osteogenesis-related factors, such as Runt-related transcription factor 2 (Runx2), bone morphogenetic protein (BMP), osteoprotegerin and osteocalcin, are involved in the subsequent repair process. Runx2 is an important transcription factor responsible for osteoblast differentiation and maturation of bone marrow stromal stem cells during bone development. The Runx2 gene has been shown to control osteoblast differentiation and formation by upregulating the transcription of various mineralization-related protein genes in chondrocytes, allowing chondrocyte differentiation into osteoblasts, and playing a key role in bone repair. 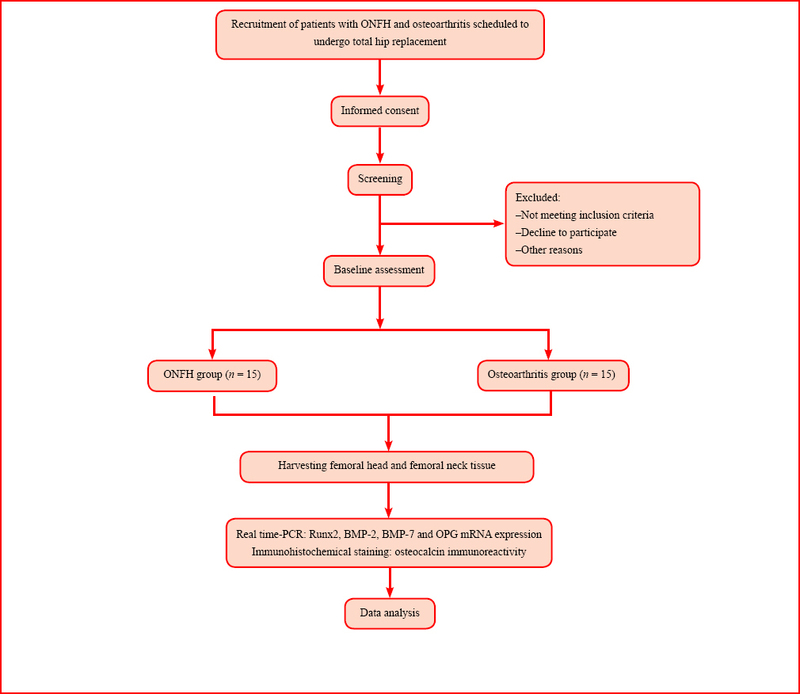 Methods/Design: A retrospective, single-center, non-randomized, parallel-controlled trial was performed at Shengjing Hospital of China Medical University, China. Fifteen patients with ONFH and 15 patients with osteoarthritis were scheduled to undergo total hip replacement. Primary measure is Runx2 messenger RNA (mRNA) expression in femoral head and neck tissue, and secondary measures include BMP-2, BMP-7 and osteoprotegerin mRNA expression, as well as osteocalcin immunoreactivity. Discussion: During 2010-2011, this study first detected mRNA expression of several bone repair-related genes, including Runx2, in the femoral head and neck of patients with ONFH. Runx2 expression was compared with that of bone tissue from osteoarthritis patients to identify expression in necrotic femoral head tissue, which help clarify the role and possible clinical significance of Runx2 in femoral head necrosis, bone repair and reconstruction. Trial registration: This trial was registered at ClinicalTrial.gov identifier: NCT02735538. Ethics: This study protocol was approved by the Ethics Committee of Shengjing Hospital of China Medical University (approval No. 2016PS222K) and was performed in accordance with the Declaration of Helsinki, formulated by the World Medical Association. Informed consent: Written informed consent was obtained from each included patient. LQY conceived and designed this study protocol. CJD and SZ wrote the paper. All authors read and approved the final version of this paper. Osteonecrosis of the femoral head (ONFH) is a destructive degenerative disease that can develop into subchondral and articular facet cartilage collapse. Among proposed pathological mechanisms underlying ONFH, much attention has been paid to the theory of increased intraosseous pressure. The core of this theory is an unbalance in osteoblast and adipocyte differentiation of bone marrow mesenchymal stem cells (BM-MSCs; Tan et al., 2012). The occurrence and development of osteonecrosis has been related to abnormal metabolism and differentiation of BM-MSCs (Tan et al., 2010, 2011). Normal adult BM-MSCs can differentiate into adipocytes and osteoblasts to maintain normal physical status. In response to exogenous stimuli (for example, use of exogenous hormonesor alcohol), the bone marrow microenvironment changes to allow more BM-MSCs to differentiate into adipocytes, leading to increased bone marrow cavity pressure, thereby inducing ischemic ONFH (Wang et al., 2015). Overexpression of Runt-related transcription factor 2 (Runx2), an osteoblast-specific transcription factor, can increase osteoblast differentiation of BM-MSCs, thereby strengthening the effects of BM-MSC transplantation to repair bone defects and necrosis (Xu et al., 2015). By controlling expression of osteocalcin, an osteoblast-specific gene, Runx2 also controls osteoblast differentiation and functioning. Osteocalcin, a common indicator used to evaluate bone formation and conversion rate (Liu et al., 2014), is a bone metabolism-regulating factor generated and secreted by osteoblasts; thus, it is considered to be a good marker for bone functioning (Yang et al., 2007). In a previous study by Chen et al. (2015), seven patients with glucocorticoid-induced ONFH at Association Research Circulation Osseous (ARCO) Stage IV were included as an experimental group and seven patients with femoral neck fracture served as a control group. Immunohistochemical staining and quantitative polymerase chain reaction (PCR) were used to detect osteocalcin immunoreactivity and Runx2 expression in femoral head and neck tissue. They found that glucocorticoid-induced ONFH is likely closely related to osteocalcin. ONFH results from an interruption of the blood supply to the femoral head or injury-caused death of chondrocytes and bone marrow components. During subsequent repair processes, bone morphogenetic proteins (BMPs) not only stimulate BM-MSCs to differentiate into osteoblasts, but also promote osteoblast growth; BMP-2 is the key factor regulating bone tissue formation (Li and Li, 2009). Sclerotin loss after ONFH is closely related to an unbalance in osteoclast activity and differentiation. Osteoprotegerin can inhibit bone absorption of mature osteoblasts and induce apoptosis of osteoblasts. Osteoprotegerin and its ligand system have been confirmed as key factors regulating osteoblast formation and differentiation, while bone absorption plays an important role in the pathogenesis and treatment of osteoporosis, osteoarthritis and bone tumors. To the best of our knowledge, there have been no controlled clinical trials examining BMP, osteocalcin, osteoprotegerin or, in particular, Runx2 messenger RNA (mRNA) expression in femoral head tissue of patients with ONFH at Ficat Stage III-IV or osteoarthritis. In this non-randomized, parallel-controlled trial, we used real-time PCR (RT-PCR) to detect Runx2, BMP-2, BMP-7 and osteoprotegerin mRNA expression in femoral head tissue from patients with ONFH at Ficat Stage III-IV. Simultaneously, we detected osteocalcin immunoreactivity using an immunohistochemical staining method, compared with osteoarthritis patients for the purpose of clarifying mechanisms of these factors in bone reconstruction post-ONFH. A retrospective, single-center, non-randomized, parallel-controlled trial. Shengjing Hospital of China Medical University, China. According to inclusion and exclusion criteria, eligible patients with signed informed consent were screened. Fifteen patients with ONFH at Ficat Stage III-IV and 15 patients with osteoarthritis underwent total hip replacement. Femoral head specimens were collected and ex vivo specimens numbered. Using RT-PCR, Runx2, BMP-2, BMP-7 and osteoprotegerin, mRNA expression levels were quantitatively analyzed. Osteocalcin immunoreactivity was detected using immunohistochemical staining ([Figure 1]). Professional staff, blinded to grouping, will perform outcome index detection and statistical analysis. Thirty patients with ONFH and hip joint osteoarthritis scheduled to undergo total hip replacement were recruited from Shengjing Hospital of China Medical University, China. Fifteen patients with ONFH (n = 15) and fifteen patients with osteoarthritis were included in this study. Femoral head and neck tissue specimens were harvested during surgery. Runx2 mRNA expression in femoral head and neck is the primary outcome. To calculate sample size, the related literature was reviewed. According to a study by Chen et al. (2015), which was the most similar to our own, Runx2 mRNA expression was significantly lower in glucocorticoid-induced ONFH patients (ARCO Stage IV; experimental group, n = 7) than in femoral head fracture patients (control group, n = 7; 1.000 ± 0.017, 0.383 ± 0.023, P < 0.001). Sample size was calculated by a two-sample t-test using Power Analysis and Sample Size 11.0 (PASS 11.0) software. Values of α = 0.05 were considered statistically significant; 1-β (powder) was 90%, 1-β = 0.9 and β = 0.1. The final effective sample size was 15 patients in each group. Participants were recruited via advertisement on the Hospital Bulletin Board or by physicians during hospital interview of patients. Patients interested in participation would contact staff responsible for this trial via telephone or e-mail acquired from the physicians. Necrotic or osteoarthritic femoral heads were replaced with artificial prostheses. One cubic centimeter (1 cm 3 ) of bone tissue was separately harvested from both the center of the femoral head and the base of the femoral neck. Part of this bone tissue was fixed in phosphate-buffered saline (PBS) containing 4% formaldehyde, while the remaining tissue was quick-frozen in liquid nitrogen at −80°C for RNA isolation. Bone tissue block (500 mg) was dissolved in 6 mL of dissolving solution at room temperature for 1 hour. RNA was extracted from this solution using a kit according to the manufacturer's instructions. Non-purified RNA will be digested in DNase at 37°C for 14 hours and then inactivated using a DNA enzyme inactivation solution. RNA was precipitated in 0.5 M ammonium acetate and then left overnight at −20°C in 100% ethanol. Dry particles were preserved in 60 μL of eluent at −80°C. Subsequently, RNA was reverse transcribed into cDNA using a reverse transcription kit. PCR products were amplified using the following primers: BMP-2: Forward 5′-CCC ACT TGG AGG AGA AAC AA-3′, Reverse 5′-GCT GTT TGT GTT TGG CTT GA-3′; Runx2: Forward 5′-GCA GTT CCC AAG CAT TTC AT-3′, Reverse 5′-CAC TCT GGC TTT GGG AAG AG-3′; BMP-7: Forward 5′-TCC GGT TTG ATC TTT CCA AG-3′, Reverse 5′-ATC CGG AAC GTC TCA TTG TC-3′; Osteoprotegerin: Forward 5′-GGC AAC ACA GCT CAC AAG AA-3′, Reverse 5′-TCT GCT CCC ACT TTC TTT CC-3′. Conventional PCR was performed on cDNA, and after purification, the product was inserted into a pCR II Blunt-TOPO vector. After conversion, cytoplasmic DNA was isolated from positive clones. Insertions were identified by restriction enzyme sequence. cDNA (50 ng) will be used for relative and absolute RT-PCR quantification. Runx2, BMP-2 and BMP-7 expression was absolutely quantified. Osteoprotegerin was relatively quantified using kits and an ABI Prism 7000 SDS (with manufacturer software) to determine mRNA levels. The 2 -∆∆Ct method was used to analyze the relative changes in gene expression. Bone tissue samples were fixed in PBS containing 4% formaldehyde at 4°C for 24 hours, decalcified in 20% EDTA for 2-4 weeks, embedded in paraffin, and then sliced into 5-μm-thick sections. Paraffin sections were dewaxed with xylene, dehydrated with an ethanol gradient, washed briefly with running water followed by distilled water, and placed in PBS for 5 minutes. Sections were digested for 10 minutes at room temperature, washed three times for 3 minutes each with PBS, and incubated with 3% H 2 O 2 at room temperature for 5 minutes to block endogenous peroxidase activity. After washing again three times for 3 minutes each, sections were blocked with 5% goat serum for 30 minutes at 37°C. After removal of serum, anti-osteocalcin antibody was added by drops and goat anti-mouse IgG antibody will be used as a negative control. Sections were then incubated for 30 minutes at 37°C and washed again three times for 3 minutes each. After addition of a horseradish peroxidase-labeled streptomycin-avidin solution, sections were incubated for 30 minutes at 37°C and then washed three times for 3 minutes each with PBS. After development of chromogenic agents, sections were washed with running water, counterstained and mounted. Image analysis was performed using an Image-Pro; Plus6.0 imaging system.Osteocalcin immunoreactivity in bone matrix was detected and an immune reactive score (IRS) was used to evaluate immunological outcomes (Friedrichs et al., 1993) based on the formula: IRS = SI × PP in which SI represents staining intensity and PP indicates positive cell percentage. SI can be divided into four grades: 0, negative (no positive cells); 1, weakly positive; 2, moderately positive; and 3, strongly positive. PP can be rated by five grades: 0, negative; 1, ≤ 10%; 2, 11-50%; 3, 51-80%; 4, > 80%. IRS scores > 3 are considered immunoreactive (+). 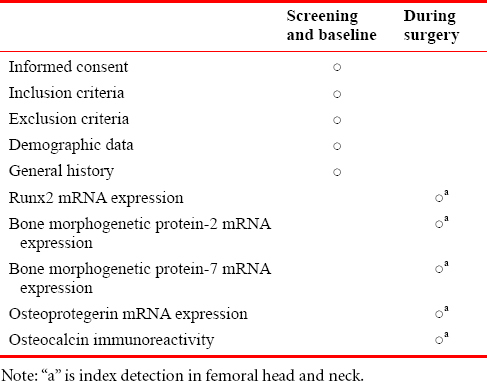 (1) Primary measures: Runx2 mRNA expression in femoral head and neck tissue. Runx2, a primary transcription factor controlling osteoblast commitment and differentiation, can be considered an osteoblast phenotype marker. When Runx2 expression and activity are inhibited, bone formation is inhibited (Liu et al., 2009). (2) Secondary measures: Expression of mRNA for bone repair-related genes including BMP-2, BMP-7 and osteoprotegerin, as well as osteocalcin immunoreactivity, which influences bone formation, in femoral head and neck tissue. The schedule for outcome assessment is shown in [Table 1]. According to the trial design, a table was formulated for data collection. Collected data were input into an electronic database by professional staff using a double-data entry strategy. Information accuracy was checked when all recruited patients were followed up. The database was locked by the researcher in charge and was not altered. All information relating to this trial was preserved by Shengjing Hospital of China Medical University, China. The electronic database was fully disclosed to a professional statistician for statistical analysis. Published data were available at http://www.figshare.com . Statistical analysis was performed by a professional statistician (blinded to grouping) using SPSS 19.0 software. If Runx2, BMP-2, BMP-7 and osteoprotegerin mRNA expression, as well as osteocalcin immunoreactivity in the femoral head and neck of patients with ONFH and osteoarthritis, were normally distributed, a two-sample t-test wasused to compare differences between groups. If, however, these data were not normally distributed, a Mann-Whitney U test was used. A level of P < 0.05 was considered statistically significant. The mechanism by which Runx2 regulates bone formation has been largely clarified (Xiao et al., 2000; de Crombrugghe et al., 2001). However, the role of Runx2 in bone repair is currently garnering more attention, as evidence has suggested Runx2 plays a key role in repair of bone necrosis (Chen et al., 2015). Therefore, a better understanding of the mechanism of Runx2 in ONFH is of great significance for treatment of this disease. This non-randomized, parallel-controlled trial detected the expression of bone repair-related genes in the femoral head and neck of patients with ONFH undergoing total hip replacement. For the first time, Runx2, BMP-2, BMP-7 and osteoprotegerin expression was compared with outcomes in corresponding osteoarthritis patients who also needed total hip replacement. This study allows us to determine changes in Runx2 expression in ONFH and clarify the role of Runx2 in ONFH, bone repair and reconstruction. This trial had been completed on December 31, 2011. Chen ZQ, He W, Wei QS, Wu W (2015) Research on expression levels of bone metabolism related protein in osseous tissue of glucocorticoid-induced necrosis of femoral head. Zhonghua Guanjie Waike Zazhi 9:183-187.
de Crombrugghe B, Lefebvre V, Nakashima K (2001) Regulatory mechanisms in the pathways of cartilage and bone formation. Curr Opin Cell Biol 13:721-727. Li LX, Li YK (2009) BMP-2 signaling pathway and osteoblast differentiation. Guoji Guke Xue Zazhi 30:132-135. Liu YW, Wang YH, Jiang YD, Zhang XD, Wang HC, Gao ST (2014) Impacts on steroid-induced femoral head necrosis, serum osteocalcin and calcitonin treated with Gugutou Huaisi Yu Capsules in rabbits. Shijie Zhongxiyi Jiehe Zazhi 9:248-250. Liu ZP, Ma XL, Ma JX, Zhang HF, Zhang Y (2009) Effects of Runx2, osterix inside the femoral head of steroid- induced osteonecrosis in rats. Zhongguo Zhongxiyi Jiehe Waike Zazhi 15:551-555. Nelson TJ, Martinez-Fernandez A, Terzic A (2010) Induced pluripotent stem cells: developmental biology to regenerative medicine.Nat Rev Cardiol 7:700-710. Schmitt-Sody M, Kirchhoff C, Mayer W, Goebel M, Jansson V (2008) Avascular necrosis of the femoral head: inter- and intraobserver variations of Ficat and ARCO classifications. Int Orthop 32:283-287. Tan G, Luo L (2011) Effects of hormone on bone marrow stromal cell differentiation and its relationship with femoral head necrosis. Zhongguo Jiaoxing Waike Zazhi 19:1100-1103. Tan G, Luo L, Kang PD, Pei FX (2010) PPARã-2 and Runx-2 and hormone-induced femoral head necrosis. Zhongguo Jiaoxing Waike Zazhi 18:1274-1277. Tan G, Kang PD, Pei FX, Xie XW, Yang J, Shen B, Zhou ZK (2012) Comparing study on expression levels of related factors in glucocorticoid-induced osteonecrosis of femoral head and hip osteoarthritis. Zhonghua Guanjie Waike Zazhi: Dianzi Ban 6:260-267. Wang BL, Li ZR, Zhang NF (2005) Pathological mechanism and early intervention of glucocorticoid-induced avascular necrosis of the femoral head. Zhongguo Jiaoxing Waike Zazhi 13:1892-1894. Xiao G, Jiang D, Thomas P, Benson MD, Guan K, Karsenty G, Franceschi RT (2000) MAPK pathways activate and phosphorylate the osteoblast-specific transcription factor, Cbfa1. J Biol Chem 275:4453-4459. Xu HJ, Li ZH, Hou YD, Fang WJ, Tang W (2015) Micro-CT evaluate the effect of Runx2 modified MSCs vein graft to repair the femoral head of ANFH rabbits. Shengwu Jishu Tongxun 6:825-829. Yang JX, Fang B, Xu CY, Li G, He W, Zeng P, Jia XJ (2007) Effect of Tongluo Shenggu capsule on osteocalcin, calcitonin and bone mineral density of rats with glucocorticoid induced avascular necrosis of femoral head. Guang Zhou Zhong Yi Yao Da Xue Xue Bao 24:41-43.